« Some Videos from Hardy Souls! After an on-time departure from Edinburgh, I arrived in Lyon and got the bus to Lyon station. Just in time to buy a ticket to Le Puy. I did not know it was yet another holiday, and found the youth hostel closed. Found a great Gites (like a hostel) attached to a hotel. Sunday was spent looking around in Le Puy-en-Velay. The Credencial was essential for the walk so I went to the Cathedral Notre Dame de Puy to collect it. Distracted by the statue of Notre Dame de France, I climbed up to take the photograph above. The next day I would head off in that direction. The Credencial from the Cathedral was in my hands soon after. Wandering around town I saw several places selling Le Puy lace. 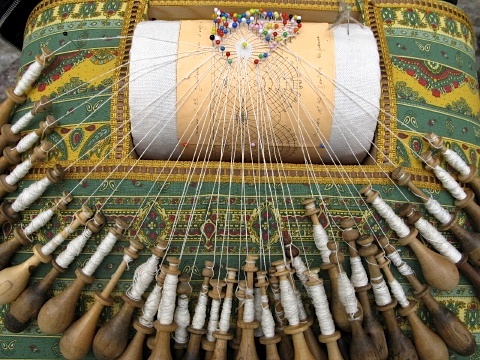 There were demonstrations of how the hand-made lace is produced. 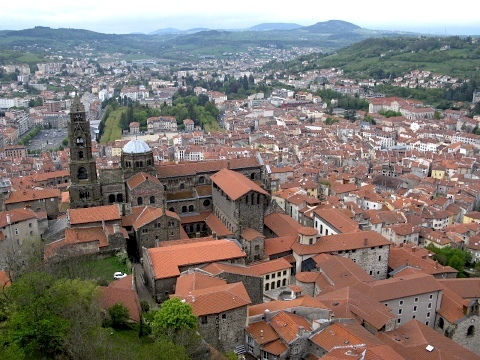 This entry was posted in From the Way and tagged Le Puy-en-Velay, Via Podiensis, Way of Saint James. Bookmark the permalink. Post a comment or leave a trackback: Trackback URL.